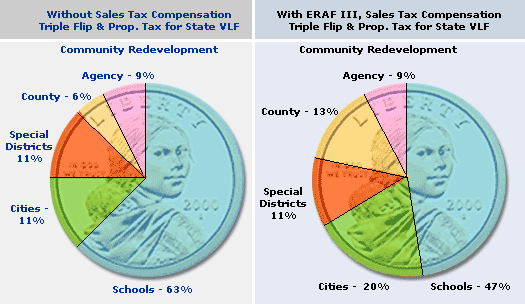 Due to new property tax legislation effective for the 2004-2005 fiscal year, the County and the cities will receive property taxes from the schools’ allocation to replace local sales taxes and vehicle license fees which transferred to the State. The State is required to backfill the schools’ revenues. Orange County receives the lowest share of property tax in the entire state of California. One percent (1%) of the County’s funds support the County Library, a non-general fund department. The largest share of all property taxes supports school districts. The Orange County Fire Authority is included with the Special Districts.